At dawn one day in the entrance of the Blue House in Seoul Hyoja risk of mad cow disease and U.S. beef imports all night to demand renegotiation and the opposition started protesting citizens, students, the police salsucha (water cannon vehicle) to be dismissed and forced to mobilize. "The demonstrators waited for a preemptive attack on the subjective judgement of what is not," he asked. "We want action demonstrators caught pod, which is justification to shoot water cannon vehicle waiting to happen, it is the dominant mood at the time," he said. But a senior position on the tube, about how to educate the people tell me altogether. "Ttaeryeora. Ttaerineunde ttaeryeora invisible(Hit them! Hit them as nobody never knows.) Everybody has a camera these days, so do not shield a bit rough for example, the shanks car." 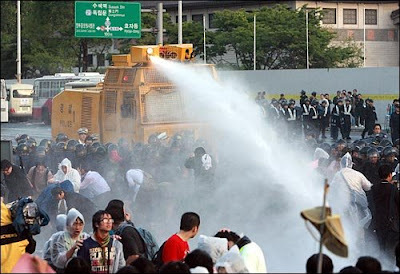 To quell the water cannon vehicle discharges water began. The morning sun is posted At Kwanghwamun , people has been blood in the streets that morning. "Water cannon vehicle moment is to continue forward, I said went in the back, pushing it to go forward without any mental blaze. People push and push until the end, at Gwanghwamun, the morning sun until you get to quell. On the road, my humanity was burnt out. Doing what I wanted done, of course, the demonstrators during violent resistance to one person could do. I have to feel badly hit, but it did not feel at all that people are unarmed and I'm holding a shield. Sounds in the state jumped to gone, because that way you will be citizens who have been on the big fear. " If the air to a larger sound, to see if the troops to go back to live in violence on police. The violent culture within the society uigyeong is less serious than some active duty soldiers. It is not an internal to external human eye to see no choice but to change too. "The atmosphere is the dominant underlying uigyeong demonstrators themselves to make and I'm tired, that the enemy is just business as a quick." he said. Guidelines for protecting quell demonstrators, but it always have troubled and not to quell it. 20 countries are so powerful tools for their own causes young people to the streets, laying them to navigate the increasingly brutal violence against demonstrators that event.